At first glance it might just seem that a recipe is an assembly of foods. We take different foods, put them together in new ways and presto- a recipe! But as I’ve been thinking about it more, I’m realizing a recipe is so much more than that. A recipe, whether it be from a book or from your own creativity, is at it’s heart a work of original art. A recipe is no different then a compilation of music, or a painting. The same way we break down music with our ears and paintings with our eyes and absorb their vibrations into our being, is exactly what happens with food and recipes. A recipe is the beautiful articulation of creativity and the digestion is taking that expression and fusing it into our being. When you take the time and put in the effort to work with your foods to make them come together in a new way, when you ingest it, you take in more than just the food, you take in the creative vibration that made that dish. You take in the care that came from your heart, through your hands, into the food, into your physical body and into the body of consciousness itself. By taking the time to consciously choose our recipes based on what is needed over what is superficially desired we deepen our capacity to experience life, liberating our hearts and souls to whole new realms of being. With that being said we are excited to share this recipe with you. 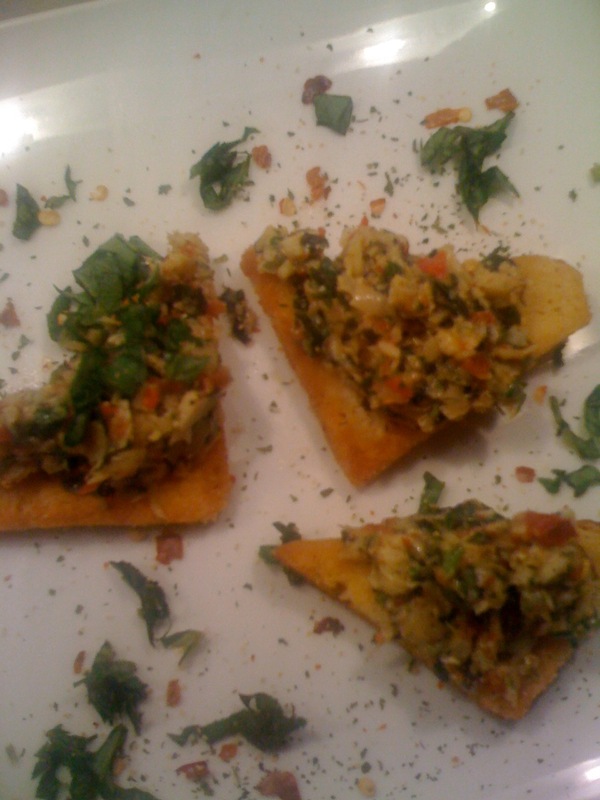 Tiffany crafted it up as an appetizer in one of her recent cooking classes and it turned out awesome! The flavors are just incredible! This puppy take virtually no time to put together, making for a great appetizer or snack. Or you can use it as a topper on your salads or even soups, or as a dip for raw veggies. Cut loaf into 4 squares or triangles. Toss in olive oil and sea salt or rosemary salt. Lay on baking sheet and bake at 400 degrees for 15 minutes or until golden. You may need to turn them one time. In food processor add the grilled artichokes, roasted peppers, basil and optional pinch of chile flakes. Pulse until mixed but still slightly chunky. 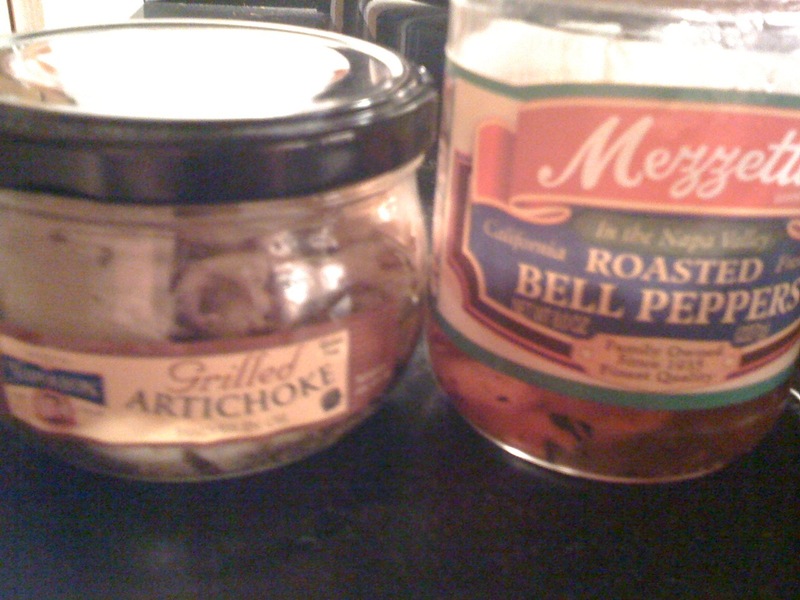 Top each toasted bread piece with a tablespoon or so of artichoke mix. Enjoy! This recipe is so delicious! I would love to hear what you think. Just post your comments below. Be sure to check out or big library of recipes and video clips on the Eating for Evolution community site. Hope to see you there! As I’ve been shedding more awareness on the choices I make around food and the thoughts that I attach or don’t attach to in relationship to this realm, one thing has become clear: If I/we really want to cultivate a wholesome and conscious relationship with food, at some point we need to reassess the lens we’re looking through and question if our perception supports this kind of development. Coming to understand food and our relationship to it is one thing, but transforming this knowledge into a living expression is slightly different. Why? Because it literally is a new posture that we develop through transforming our own self. 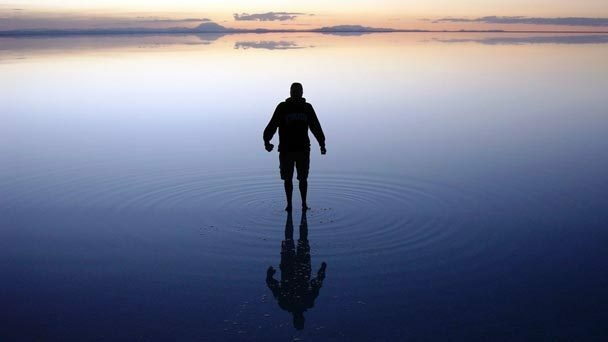 It’s alchemy really; where we take our knowledge and values and infuse them into our being in such a way that we literally redefine our sense of self, which in turn alters how we relate to life in a very tangible way. As I’ve been exploring how to obtain this “new posture” and what it means, it’s become clear that this sort of transformation is outside the boundaries of the mind. We can think of it as relating to food (or life for that matter) from two different perspectives. One, the dimension of the mind, is where we collect knowledge and facts, analyze and assess what is true and what isn’t. From this perspective we can accumulate a lot but it doesn’t necessarily mean we do anything with this information. As we enter into the other perspective, a more philosophical position if you will, we see that we can take those nuggets of knowledge, and the values they promote, and apply them to our own sense of self. Here we realize that we are conscious creators not only of material things but of our own being. We find from this perspective the truth in the saying “you are what you eat.” And just as the common metal is transformed into gold and silver we begin to see that life has inherent meaning, significance and purpose to it, and that we are all a part of a greater living universe. When we come to know this from our own depths, our own interiority, we can freely embrace all facets of life and all levels of development, giving us the capacity to give more, to make more conscious choices and to become a living expression of something much deeper. I realize this is pushing the edge a bit here as we aren’t really use to thinking about our relationship to food so deeply, but if you stick with me just a bit I think you’ll see what I mean. Let’s take a real life example to help clarify these different perspectives. As well as being the co-creator of EFE I am also an acupuncture student. For a prerequisite I took a course on nutrition. It was a two day course packed solid with lectures on the scientific breakdown of foods and their bio-chemical-nutrient components. As I started the course I, as were my fellow students, were completely excited to learn more about food. And boy did we! We gained a lot of knowledge over the course of the weekend. However, when class came to a close I noticed that something in my classmates and I had shifted. It seemed we all went from excitement to paranoid in 2 days flat. I went from being from being adventurous and creative with my eats to being frustrated with all the “nutritionism dogma.” What had happened? Obviously we need to retain the scientific knowledge of food, but at the same time I have seen far too many people suffer from food induced paranoia and actually wreck their health as they try to follow the “nutritional” diet. So where does this leave us? Our culture is predominately embedded in a reductionist mentality when it comes to our food and health. Meaning, we still take things and break them down to their tiniest components rather than looking at the whole picture. Of course this is certainly valuable. For example, if we didn’t have this approach we wouldn’t know that certain combinations of vitamins and minerals in our system can actually block our absorption of other nutrients, not to mention we would be a lot more clueless when it comes to knowing anything our biochemistry. Yes, the reductionist model does hold it’s worth from one undeniable perspective. However, we can see that from this perspective we can easily get lost in the nitty-gritty and forget that from there we’re only seeing one tiny part of a whole. Clearly we need both perspectives. So what does that look like? For me it looks like bringing in the educational component into a bigger perspective in a way that complements and enriches my experience with food and life. Meaning, I learn about the basics of food but I don’t obsess about it. I’m more interested in having a wholesome, flourishing relationship with food and life than sticking to a specific diet or “nutritional lab-tested recipe.” I am more interested in eating in a way that promotes my whole being from biology to consciousness. I’ve found that if I stand in this position everything naturally falls in line; from education, to choosing foods and recipes, to preparing nourishing meals, to the table, all the way up and out to self and cultural development. There is an ease and self-refueling positivity that emerges when our appetite is satisfied with not only good, wholesome foods, but development on all levels of our being, be it inner and outer.